Good for small heavy items such as tools, pantry items, books, CDs and small kitchen appliances. This is the most popular box we sell. It's ideal for kitchen items, small appliances and toys. It's big enough to hold several items, but small enough to carry. Large box is ideal for lightweight, bulky items. 16X12X12 Good for books, small heavy items and small kitchen appliances. 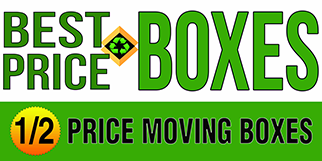 Large box is ideal for lightweight, bulky items such as lampshades, stereo speakers, electronic equipment, stuffed animals or clothing. Excellent for pot and pan sets. Works well for glass ware if cell pack is used. Double walled for extra strength. Adjustable Sizing box. This box is excellent for the odd or over sized mirrors. The four pieces go over each corner of your mirror. They meet in the middle of the mirror and are then taped together for a snug fit. This 4 piece box kit fits snugly over all 4 corners of your mirror and then is taped together. This is a way of creating your own box size that is customer fitted to your mirror or picture.